Whether you need a basic tub to shower conversion or a complete bathroom remodel, we are your answer. We will visit your home at your convenience, evaluate your bathroom, listen to your wants and needs and use our experience to find solutions to stay within your budget. Based on the options you choose, we will give you a competitive price with no high pressure sales tactics. You won’t be waiting around for weeks to get your new bathroom completed. Most jobs can be finished within one week. We show up on time and stay until your job is done. Our focus is to give you expert quality service from our initial meeting right through to the completion of your beautiful new bathroom. Should you ever need us after the project is finished, you can rest assured knowing that we will be there for you then as well. 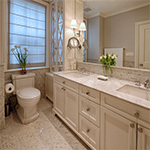 We are a full service bathroom remodeling company dedicated to making bathrooms luxurious and beautiful.